We love spending time with visionaries. The thing about visionaries is that most wouldn’t claim that title themselves, and yet our guest in this episode certainly is a visionary, ideator and creator. Tasha Wahl is an artist, philanthropist and businesswoman, and, a wife and mom of five! Tasha is the executive director of the Wahl Group consultancy firm and works with her husband, Erik Wahl, a world-renowned artist, author, and speaker. Tasha and Erik spend much of the year speaking on tour for their company, The Vision of Art. Tasha is the founder of Butterfly Effect, (www.butterflyeffectbethechange.com) an interactive philanthropic movement whose message echo’s Gandhi’s belief that we must each be the change we want to see in the world. We first learned of Tasha after seeing her husband, Erik Wahl, interviewed on the Gary Vaynerchuk Show, (which episode you can see in the ‘Resources’ links below). In perusing Erik’s information, we also discovered Tasha’s. 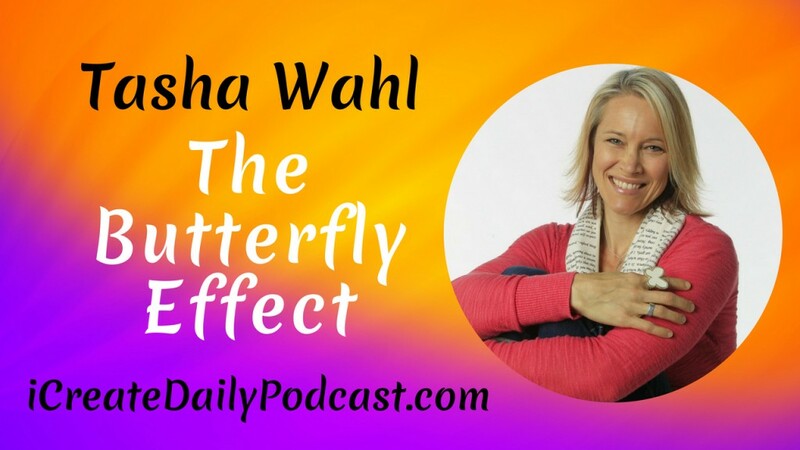 Tasha Wahl is an artist herself, and she has morphed her creativity with her extraordinary compassion to create the non-profit organization, The Butterfly Effect – Be the Change. I have a fledgling idea, of how I want to be the change, and hopefully set into motion molecules of hope, that will set into motion molecules of faith, that will set into motion molecules of love. You know you’re educated when you still have much to learn. If I can open each day with my hands open in a seeking place, then whatever I’m supposed to learn will come. It was wonderful to catch up with Tasha, and we love that we got to share her side of the “Erik Wahl” story! Tasha’s profound article on love and marriage and the many “men” she’s married (we forgot to talk about this, but it’s amazing)!